Speaking from experience, I know that the bigger that tum gets, the easier it is to feel ungainly, and scarves are good for creating a visual distraction (and keeping you warm of course!) 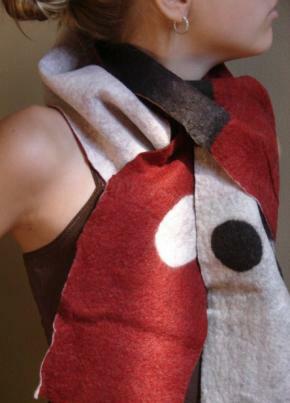 so these scarves from Thistle Downs Wool Designs are both beautiful and functional. You know those horrid maternity pants that have the big elastic half moon that is supposed to fit over your belly? Ugh! Try these soft and comfy cotton pants from Sandmaiden instead. You can put the waistband right down on your hips below your belly, relax and aahhh, look great.